I had wanted to go to Blue Ribbon Wine Bar originally but like many others, we mistakenly walked into Blue Ribbon Bakery instead. It was cold outside and there were two seats at the bar, so we happily embraced our mistake and sat down. 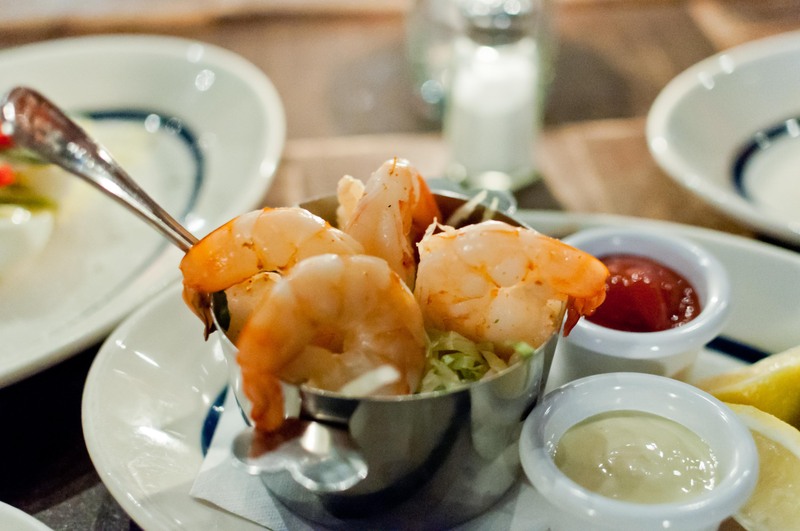 It was kind of the perfect setup – a bar with only 6 seats tucked away in the left hand side of the restaurant, away from the chaotic and full dining area. 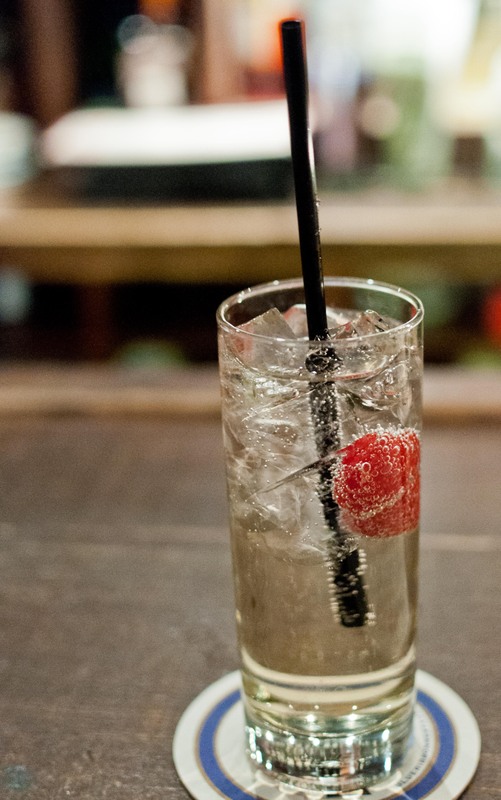 I was soon sipping a sweet cava with elderflower and seltzer while MD found comfort in a manlier drink on the menu – something much stronger than mine. Neither of us were starving so we agreed to sample the appetizers and small plates instead although I did consider ordering a plate of their fried chicken all by myself for a brief moment. 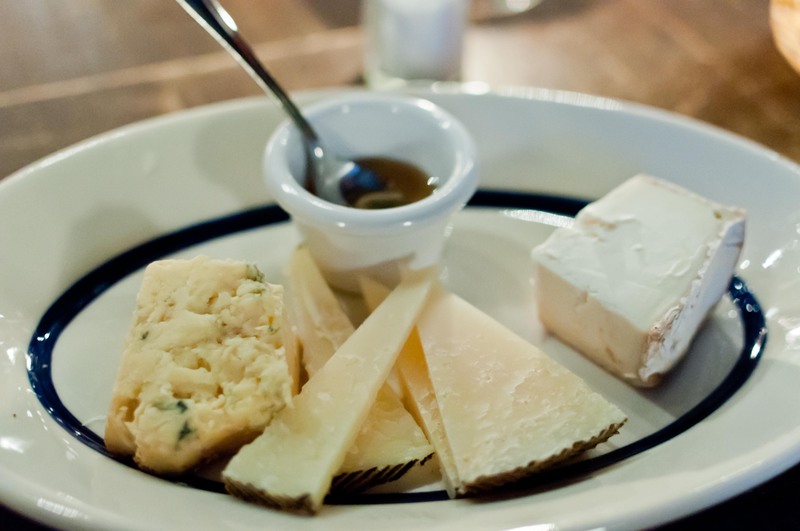 A trio of cheeses – a Manchego from Spain, a Stilton from England, and a Leonora from Spain. I loved the honey that came with so much that I was drizzling freely over every bite of the Stilton. 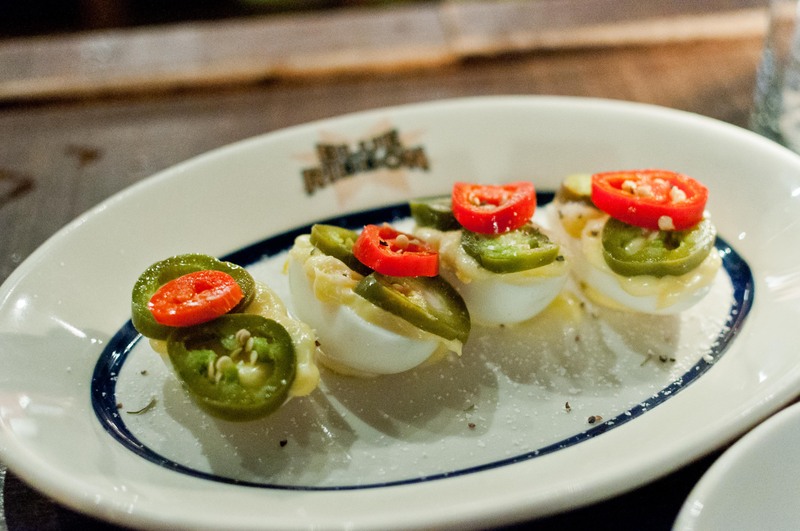 Deviled eggs with pickled hot peppers. It was a little unclear how many would come in an order but I was pretty happy when two whole eggs appeared. Even though we love peppers, three slices proved to be a little too much for the mild eggs. 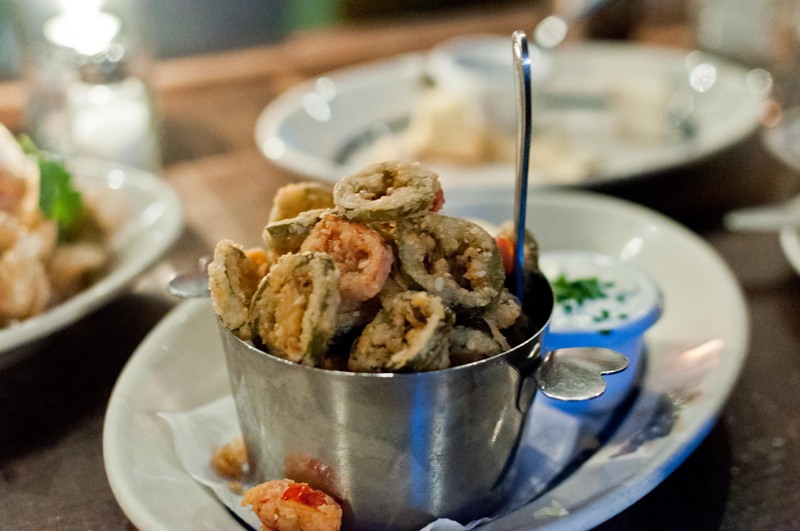 An order of the Cajun shrimp cocktail followed. These were plump and seasoned with just the right amount of spices. They were even so considerate as to remove the tails. 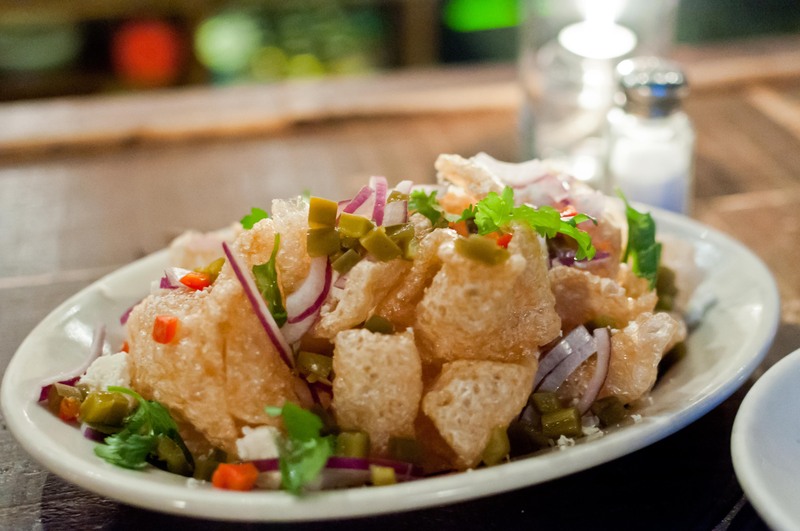 And yes, I did order the chicharron. I just can’t resist fried pork skins. Served with chopped peppers, onions and feta, this was a twisted version of nachos. I do wish that the ingredients stuck to each other a little easier so I would have been able to avoid unhinging my jaw when trying to get one bite with everything on it. Fried hot peppers with sour cream seemed a little unnecessary given our already vastly unhealthy collection of small bites. And I have to admit, it was a little too much. We barely made it through the bucketful even though they were pretty addicting. Finally, we ended with the Blue Ribbon beef tartare. I do love the combination of pungent mustard and tangy capers with the sharp onions and sweet beef. 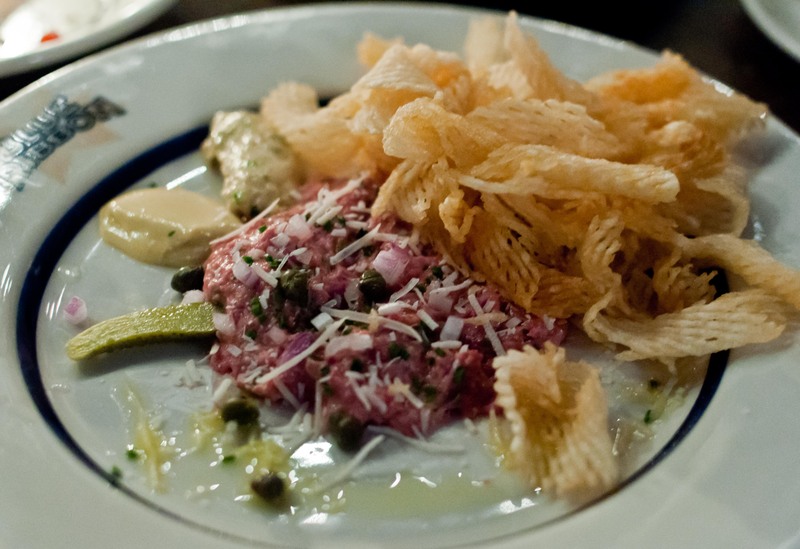 So much so that I didn’t even care too much that the meat lacked a little chew that I tend to like from a tartare. We both loved our bartender and even more so after he pointed us to the basket of bread that Blue Ribbon Bakery sets out by the door. Take a few loaves home, he suggested, after you visit the oven downstairs. We took a self guided tour (more like a peek) of the old style oven left behind from the building’s prior life as a tenement house and, of course, we left with a loaf of focaccia and a loaf of miche. Hey, Thanks for the cool review and for having been our guest. And thanks for pointing out your comments on the egg shooter dish. The pepper slices should have been thinner. Sorry for that! Corrections have been made.